Hello, cardmakers! I hope you had a great Thanksgiving weekend! Don’t forget to get your Love or Valentine themed cards in ASAP so they can be counted toward the Archway + OWH Special Mission. We want lots of cookies for our troops! 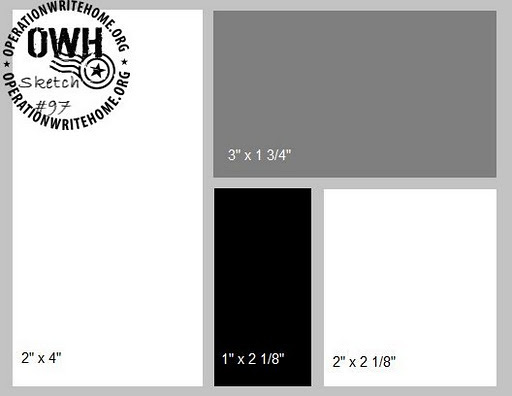 For them to count, the cards need to be received by your shipper on or before December 10th. Today’s sketch would make some cute love cards, I bet. See what you can do with it! We have two great sample cards today made by Kelly. She isn’t a blogger so be sure and leave some love on this post! Aren’t those flowers gorgeous? Thank you so much for these beautiful samples, Kelly! Update: Turns out Kelly is a blogger after all! Oops! Please check it out and see more of her awesome work: You and Your Big Dreams. Ok, folks, get busy making some love cards! Be sure and come back to link up your blog or gallery page so we can all see! Kelly, your cards are both adorable and so pleasing to the eye! Thanks for the inspiration! Great sketch. Love your samples, Kelly, especially the split image. I have at least 2 stamps to try that with! Kelly, Great cards especially the flower card. It really looks like we are looking into a full field of flowers. Pretty and inspiring sample cards, Kelly! The flowers seem to pop off the first card and what child wouldn't love all the elements of your 2nd card!! Great job! Both cards really rock the sketch! Love the coloring! Thanks for sharing, Kelly! Wow, beautiful cards. I don't think I want to attempt this sketch but you did a wonderful job. both beautiful cards! Thanks for the inspiration! Great job ladies! This is such a fun sketch! I love your sample cards, Kelly! Very pretty indeed! Thanks for sharing and inspiring me to get busy too! Interesting sketch…think I'll give it a try! 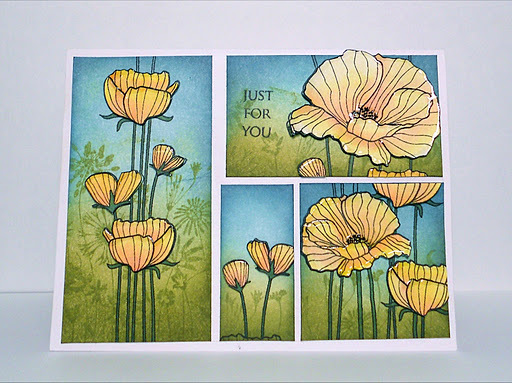 Awesome coloring…beautiful card samples! Great sketch and I love the sample cards. 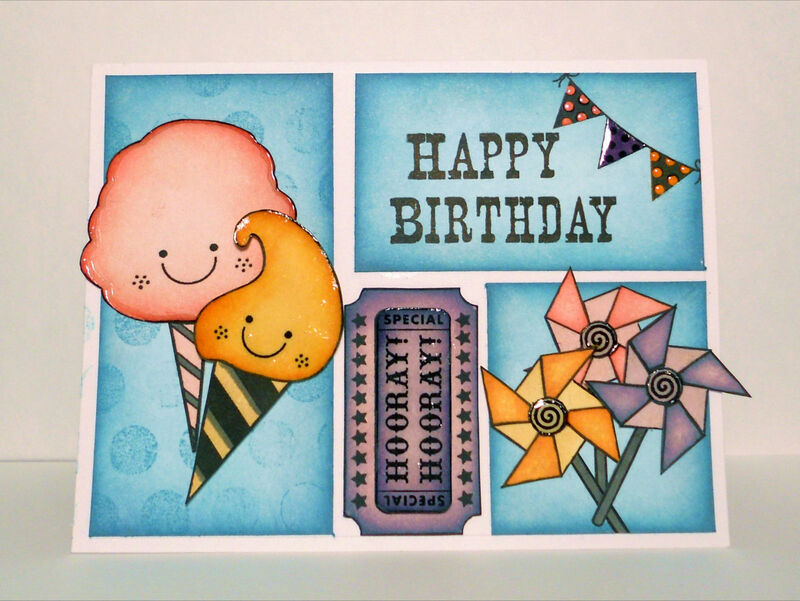 The flower card is simply beautiful and the ice cream cone card is so fun! Thanks for your blog address – I will be paying you a visit! Thanks to Julie and Kelly for the sketch and examples! LOVE your cards!! I thought that was a very challenging sketch…love what you did with it! Pat K.
Oh Kelly these cards are so pretty! You did a fabulous job with the shading! That birthday card is so CUTE! Are the cotton candy and ice cream cone images stickers? I love the coloring on both of the cards. I can only hope to color as well as you someday. I love the cards that are posted – I especially love the hearts and the flower on Linda's – way to go! Wow… Kelly your cards are gorgeous! Such sweet cards Kelly! The split images are darling! What a fun Sketch! Two beautiful cards! Thanks for the inspiration! Wow what gorgeous cards. I can't wait to go to your blog and see how you made colored these beautiful cards. Julie, this is a very fun sketch! Kelly, those are goreous card samples! oh, I really like this sketch!